Sierra lodgepole pine (Pinus contorta var. murrayana), upper Truckee River, CA. Photo: K. McCutcheon. Needles: 2” long, lemon-scented, in bundles of two. Cones: 2” long, round and prickly. Sierra lodgepole pine grow tall (90 to 100 feet), straight-trunked, and can live for over 600 years. In upland forests, lodgepole pine often form dense monocultures (Cope 1993), but along the upper reaches of the Truckee River from Lake Tahoe down to Verdi, these trees grow scattered along the riverbanks as single, large-trunked individuals. Lodgepole have the youngest age-of-reproduction of any species of pine on the Truckee. 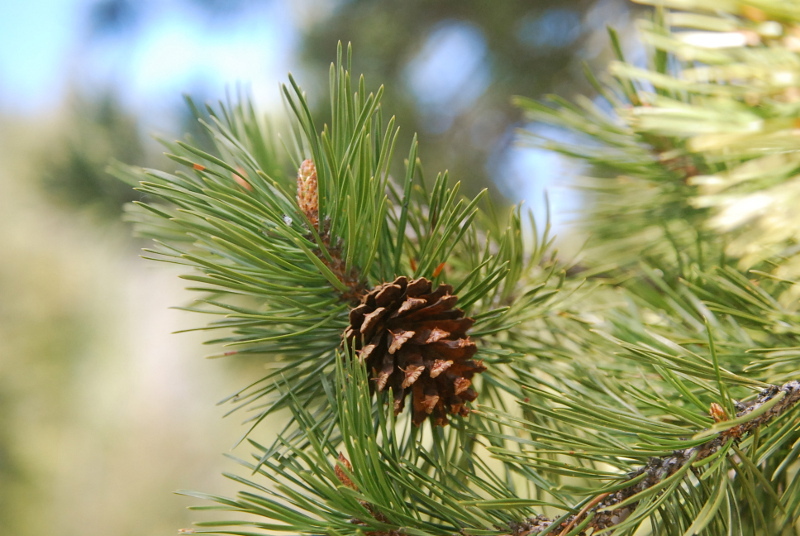 Cones first appear on the tree at 4-8 years of age (compare to the Sierra white fir, which doesn’t produce its first cone crop until age 40). By producing very large quantities of seed, the lodgepole pine is able to quickly colonize new areas after a disturbance such as a forest fire. For proof, look at the ground beneath a mature lodgepole: there you will find hundreds of golf-ball sized cones. Mature lodgepole produce large cone-crops every 1-3 years, with wind-dispersed seeds that fly into disturbed areas and germinate with unusually high survival rates. Seedlings are moderately shade-tolerant and grow quickly, often forming pure stands of lodgepole that crowd out other species and persist until the next disturbance (Cope 1993). Pitch (sap) of any species of pine, lodgepole included, can be used medicinally to remove splinters. When warmed and placed over a splinter, chemicals in the pitch stimulate an increase in blood circulation to the site, increasing inflammation, drawing pus and fluids, and prompting the body’s natural immune response. The splinter will generally pop out the next day (Moore, 2003). Sierra lodgepole pine is used for food cover, and habitat by over 30 species of mammals and 50 species of birds (Cope 1993). Do you have information on Sierra lodgepole pine, or photographs taken locally? If so, please contribute photos and observations here, or email information to kelseymccutcheon@gmail.com. Thanks! Cope, Amy B. 1993. Pinus contorta var. murrayana. In: Fire Effects Information System, [Online]. U.S. Department of Agriculture, Forest Service, Rocky Mountain Research Station, Fire Sciences Laboratory (Producer). Available: http://www.fs.fed.us/database/feis/ [2014, December 31]. Moore, M. 2003. Medicinal Plants of the Mountain West (Revised and Expanded Edition ed.). Santa Fe: Museum of New Mexico Press.